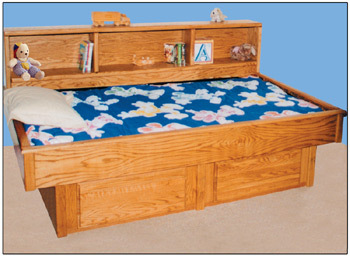 This versatile and dependable bed is actually a bed, a dresser, and a bookshelf unit all-in-one! Built to withstand the challenges of the most aggressive youngster, it will easliy sustain all stages from toddler to dorm room! Due to the natural coloration of wood, and the differences in the way color is depicted on your monitor, the actual finish of the wood may not exactly match the photograph. Available in Super Single 48" x 84". Suitable for Hardside Waterbeds only.